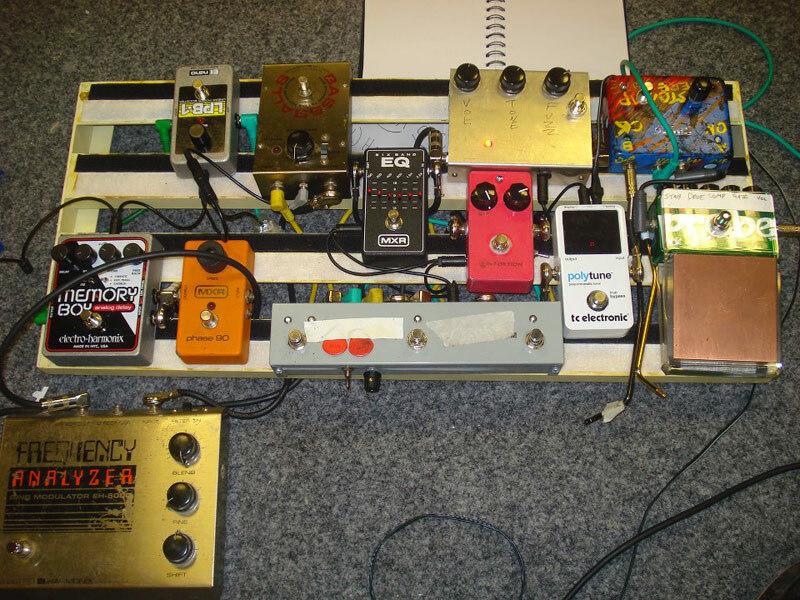 Today’s pedal line is from Gareth Orr. If you have a pedal line (doesn’t have to be in a board) for your rig, please email me a photo, bio, description of pedals and routing to pedalline@nulleffectsbay.com. Every Friday I’ll showcase a pedal line submission. Make sure you include any links to your band or music page. Hi there, I’m Gaz here’s my board I used for my band Bacchus Baracus recording session of our album which we’re just mixing. The pedals are as follows. The grey 3 switch unit is, 1 footswitch (right) and 2 loops (middle and left). The signal flow goes as this. Guitar into Fuzz Probe, which goes into A/B box. The other input (with volume control has my Theremin. A/B box into tuner, which runs into the grey switching unit. the first loop is for my drive chain which is Big Muff into Blessed By, into Eq. This gives me many tonal options for different drives. My modulation loop runs like this. First Bassballs, into Frequency Analyzer, into Phase 90, into Memory Boy and into LPB. So I might be best sending a video of me using it and maybe our song I use it in. Let me know if you want a video or tune to demo the feedback. Fuzz Box Girl - Fuzz Fatale Available for PurchaseGearmanndude - Pedal Labels Video! You should get a Boss fs-5u expression for your memory boy, I have one on mine it is the best thing I’ve ever done, plus if you modify your memory boy you can get two fs-5u’s and use one as a tap tempo and the other as a chorus, I’m going to be doing this I just have to find someone to do it for me.